The New York Times Travel Show is an opportunity to meet other travelers, speak to industry people from destinations you may or may not be interested in as well as attend seminars and meet travel celebrities. It’s always held within the first few months of the year, and you can buy tickets the day of the event. The fact that a new subway station opened across the street from the Javits Center in September 2015 makes it more convenient than ever for people to attend. With more than 30,000 attendees, the 2017 New York Times Travel Show boasted the highest attendance in its 14-year history. 560 companies representing more than 170 countries also set a show record. If you plan to attend seminars, a two-day pass is preferable. Seminars can take up the better part of a day, leaving little time to explore the floor. The cost to add a day to your pass is minimal and having an extra day reduces the likelihood of missing important seminars, booths, etc. There’s a bookstore adjacent to the seminar rooms. For book signings, it’s best to stay in the back of the line. Authors don’t leave until everyone has gone, so by letting everyone else rush through, you may get a few extra minutes to ask that question that’s been puzzling you since took your first international trip. Saturday’s speakers included travel show regulars like Pauline Frommer, Peter Greenberg, Rudy Maxa, and Ralph Velasco. There were also niche-focused seminars on festivals and markets, photography, safaris, wellness travel, and more. 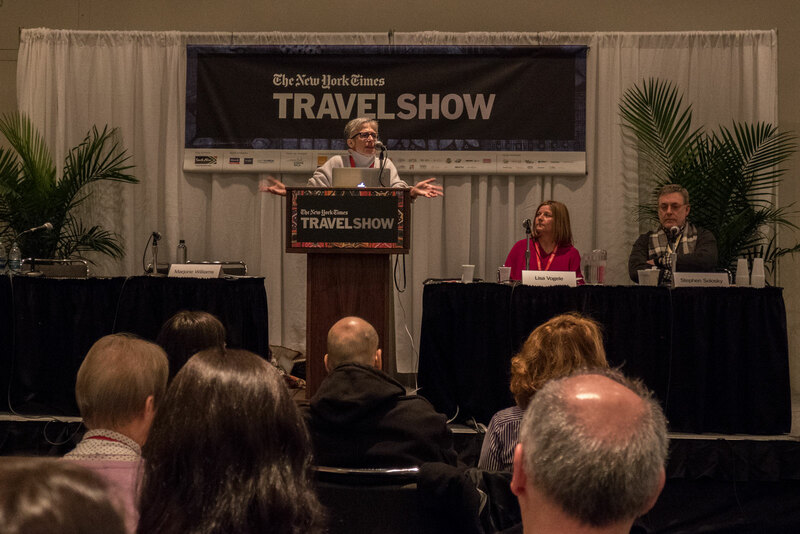 Although he used to live uptown and still considers himself an east coast guy, Rudy Maxa‘s appearance at the 2017 New York Times Travel Show was his first. He was joined on stage by Mary and Robert Carey who offered thought-provoking observations like millennials and their desire to have things done for them being largely responsible for the resurgence of travel agents. All agreed that 57 days out is the ideal time to purchase an airline ticket and medical evacuation insurance is a must when traveling overseas. Barbara Ireland and Valarie D’Elia spoke about the 36 Hours travel column from the New York Times as well as the book. The Bronx and Staten Island are conspicuously absent in the book, but Ireland offered advice on taming New York City: break it into pieces. Larger cities like New York and London are, in fact, best appreciated as a series of neighborhoods. Festivals and Markets was one of the niche-oriented presentations. York, Pennsylvania-native, and author, Marjorie R. Williams, refers to markets as “windows into the soul of a place.” Former statistics professor, Steve Solosky took an early retirement to lead small group tours to Europe. Solosky insists that the real Christmas takes place in the markets. Many attendees were stunned to find out hat Vienna alone has 40 different Christmas markets. Author and foodie, Lisa Vogele, spoke about her festival experiences, mostly in Italy. Frommer and Velasco spoke again on Sunday, which also featured Patricia Schultz (author of 1,000 Places to See Before You Die), Mickela Mallozzi (travelbarefeet.com), Max Hartshorne, and Paul Shoul (of GoNOMAD.com). GoNOMAD Editor, Max Hartshorne offered practical tips like use old posts to populate your Twitter feed and avoid overused terms like “amazing” and “very.” He uses a separate notebook for each trip. He now has more than 100. Photographer Paul Shoul spoke along with a slideshow of pictures he’s taken from around the world. He’s a Canon advocate who shoots with two cameras and was upfront about the effect that has had on his back. Many audience members gasped during the Q and A when Shoul told the audience that he sometimes spends up to two hours per photo in Lightroom and Photoshop. This post was sponsored by the New York Times Travel Show. Read my review of the 2018 New York Times Travel Show here. I had no idea that the New York Times travel show exist 14 years now! Your advice on when standing in line to get an autograph is great, people always rush it and don’t get a chance to achieve more. How cool is this?! I had no idea it existed. I can’t even imagine the stories everybody would have to share. And .. I loved reading about the man who spent two hours per photo editing! I gasped too .. yikes! This is something i really wanted to attend. Hopefully next year I will. Bookmarking your post. Thank you for sharing this! I think I would be like a kid in a candy store if I ever visit something like this. It would be a very interesting event to go, so I will keep an eye out for a travel event here in Atlanta! I’ve only been to one travel conference. And that was a travel bloggers one. But shows like The New York Times Travel Show and the recent ITB have opened my eyes. I had no idea there was a travelers show in NYC. As I love to travel it seems right up my alley! Thanks for showcasing it! My biggest question would be do you think it provides a real opportunity to get work out of it. Are you able to connect with people on the expo floor that will turn into future work? They always have such great speakers there! I’ve often seen adverts for these kind of events, and just imagined they’d be full of salesmen people peddling new tours. The seminars that you mentioned sounded both enjoyable and educational. If you can pick up some tips from the greats then that alone pays for the price of entry. I’ll certainly keep an eye out for future events. I did not even know this existed! Must have been a fascinating experience! Pretty neat some of the tips you learned in regards to blogging as well. Using Amazing and Very seems a little obvious..I also recently heard to never, ever use the word MAGICAL in travel writing. It is considered the most over used word in travel writing! Wow never knew about the New York Times travel show but sounds awesome! I watch and read enough travel shows and sites and always fascinated to read about people’s travels. Didn’t actually realise the New York Times had a travel shoe at all. I wonder if there’s something similar in the UK? Would be great to attend something like this, bet you learnt a fair few things! Tom, World Travel Market is in London. I love travel shows, especially when they are full of useful conferences and you can meet people from the industry. I have never attended the New York Travel show but last year I’ve been to the world travel market in London and it was amazing and overwhelming in the same time. 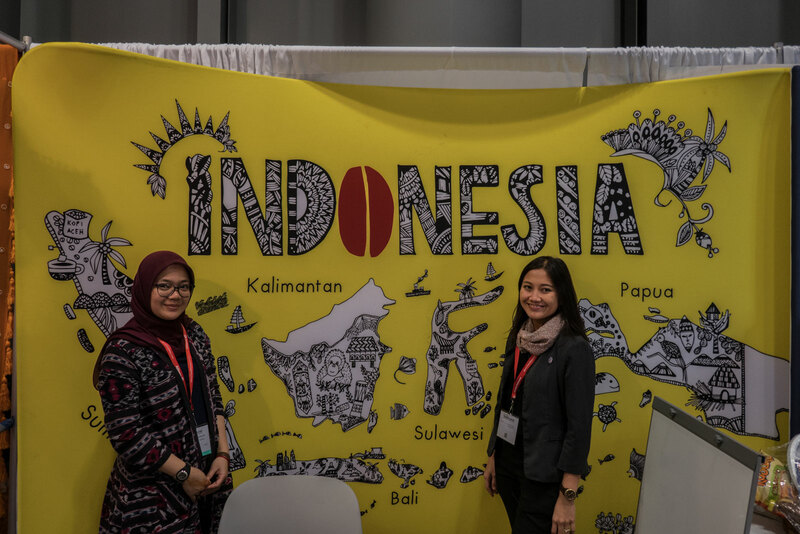 I remember Indonesia’s stand, they had a similar approach as the NY Travel show. I’ll be looking forward to attend this year as well, much more prepared than last year. never thought about attending a travel seminar or a course, but that sounds like it could be useful. That show must have been a blast. I love trade shows anyway, I grew up in a city with lots of trade shows open to the public. I loved them as a child, and still do. Blessings! That’s a great tip about staying in the back of the line…then you’re not as rushed to say something! Great article…I had no idea an event like this existed! I’ve never been to a travel conference, but I would love to go! And this is the perfect excuse to travel to New York City! I bet this is great for exchanging ideas and making connections! Do you know if there is one in Texas, by any chance? I would love to attend one of these and be around people who love travelling as much as me. I cannot believe that guy can spend up to 2 hours on a photo!! I am lucky if I spend 2 seconds per photo!! Sounds like the NYT show is a little better organized than the LA Travel and Adventure show. Maybe I just needed to plan better. Another tip I might add is that if you have travel agent credentials, you’ll have more swift access to many of the professionals doing the show, including some very open ears who want to hear about client experiences and your own travel thoughts. Not that everybody is an agent in addition to everything else in life, but just sayin’. Sounds like such a fun event. The speakers passed on some great info. Thanks for sharing what you learned there. This sounds like a really interesting show to attend. I have visited shows in the Netherlands before, but this one sounds like there is also great tips for bloggers and travel professionals. Great article! I would love to join one of these travel shows in near future. It sounds like a great place to get some much needed informations! Travel shows are a great place to network with fellow travellers and get insights to the travel industry. Loved reading the post.Hope to attend this one sometime. How very interesting, I never knew about this travel show. I’d love to attend, shame I am just on the other side of the ocean! I’ve never been to a Travel Convention before! It definitely sounds like a great experience. 🙂 Also it would be a great way to meet other travellers! This is the first time I’m hearing about the Travel event, it seems like a perfect way to connect with others bloggers and share stories. The seminars are also very interesting, thanks for sharing! 2 hours per photo! That is dedication. 100 travel note books! That is a travel goal. I am simply awed by this article. It must have been a wonderful and inspirational experience for you. I always wanted to attend NY times travel show as my favorite travel writer Julia Dimon speaks on the show sometimes. Great tips on staying at the back of the line during the book signing so to have more time to mingle with the writers. It is also one of my favorite things to do.